With the growing demand for battery electric vehicles (BEV) and plug-in hybrid electric vehicles (PHEV), dissipating battery heat and providing protection against electrical interference have never been more pertinent. According to the ‘European Vehicle Market Statistics Pocketbook 2016/17’, which is published annually by the International Council of Clean Transportation (ICCT), electric vehicles already comprise 1.5% of all new car sales across the European Union (EU). In some member states, this is significantly higher, such as 9.7% in the Netherlands and 2.2% in France. Meanwhile in Norway, which is the world’s leading market for electric vehicles in terms of market share, PHEVs and BEVs accounted for a staggering 40% of new cars registered in 2016. Norway’s tax incentives are geared to increase this to 100% by 2025. On a global basis decarbonisation and cleaner air initiatives will continue to drive the demand for electric vehicles with China emerging as a major adopter of electric vehicle technology. There is a combination of factors driving demand for electric vehicles. First, the European Commission (EC) is constantly revising down its CO2 emissions targets, with 95g/km set for 2020. In terms of fuel consumption, this equates to about 3.8l per 100km. A second key driver is taxation, with growing health concerns about the nitrogen oxides (NOx) and particulates emitted by diesel cars almost certainly prompting increasing financial penalties for this type of vehicle. Although electric vehicles represent a greener and cleaner future they come with a number of technology challenges, not least involving the battery pack, which is inevitably more sizeable. When these large batteries need to provide as much power as possible to supply energy to the car, they generate a considerable amount of heat that must be dissipated. Left unchecked, excessive heat can cause faster battery wear, reduced performance (due to uneven temperature distribution) and reduced charge efficiency, not to mention the obvious safety hazards associated with thermal runaway of the battery packs. 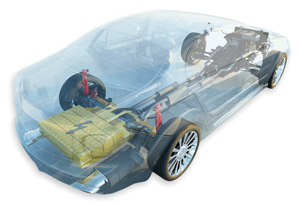 Effective thermal management is therefore critical to optimise battery performance and longevity, with improved safety and reliability, allowing vehicles to travel greater distances and increasing the achievable run-time on a single charge. The modus operandi for delivering thermal management is often liquid cooling, whereby two cooling loops/coils typically serve various sub-assemblies of the battery to manage heat. Clearly, however, electrical batteries and cooling fluid do not mix, which is why thermal interface gels are dispensed between the coils and the aluminium chassis of the battery for greater safety. This delivers long-term thermal stability and performance and also prevents any opportunity for an electrical short. Parker Chomerics can offer a range of gel products proven in this function. These THERM-A-GAP gels are highly conformable, pre-cured or cure-in-place, one-component compounds featuring a cross-linked structure. Both silicone and non-silicone gels can be offered depending on the specific thermal conductivity requirements. The gels are particularly suitable in volume markets such as automotive due to ease-of-dispensing using robotics or automation, thus reducing cycle times and costs considerably. As part of its added-value offer, Chomerics can even place the foils that manage voltage breakdown on to the aluminium heatsink. THERM-A-GAP filler pads are suitable for assemblies that might require some additional support and higher electrical isolation. By way of a further benefit for drivers during cold winter months, thermal interface materials, such as gels and pads, help the battery reach its optimum temperature, and performance, quicker. As well as effective thermal management, another technology challenge presented by the growing demand for electric vehicles is the need to shield against EMI (electromagnetic interference). The cables that travel between the battery and engine, as well as the battery and charger, see high current produced at low frequency. This produces a large magnetic field that can negatively affect other electronics within the vehicle. High shielding attenuation is also required to protect the battery and its circuits from any incoming EMI. To overcome these issues, a variety of EMI shielding elastomers or extruded gaskets can be used. Chomerics CHO-SEAL products, for example, are filled with conductive particles and connect interfacing components to reduce the air gap and create a Faraday Cage that blocks EMI fields. Among many attributes, they resist compression set and accommodate low closure force. Very often batteries also need to be sealed against environmental dust/fluids. Here, it is possible to deploy combined solutions to support EMI and environmental shielding/sealing. For battery applications requiring co-extruded gaskets, such as shielding the electric traction elements, special form-in-place (FIP) materials are available. Again, these lend themselves to robot dispensing, while the ability to create bespoke shapes is a further benefit. One last development to mention is the replacement of metal housings with plastic versions. Here, an electrically conductive plastic alternative can be exchanged for the battery electronic control unit’s (ECU) conventional die-cast aluminium housing. Metal to plastic conversions not only eliminate 35% of the housing weight, but also provide cost reductions of up to 65% by eliminating secondary operations such as assembly and machining. Parker’s PREMIER PBT-225, used for this application, is a single pellet electrically conductive polybutylene terephthalate (PBT) that offers many comparable properties to those of aluminium, along with weight reduction which helps improve the performance of electric vehicles. Both BEV and PHEV electric vehicles are developing fast in line with growing demand. However, only by selecting proven, reliable, high-quality products for the effective thermal management and EMI shielding of batteries, is it possible to maximise performance.